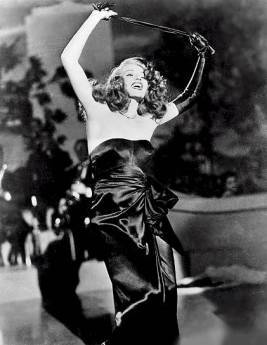 Songs: by Doris Fisher & Allan Roberts: "Amado Mio," "Put the Blame On Mame"
Gilda represents the indelible image the public continues to have of Rita to this day. This movie made her the most sought after star in the world. Production on September 7, 1945. Rita had no way of knowing she would forever after remain "Gilda". Back then there were not as many interviews with the stars on television and in magazines like there are these days, making it more difficult to "get to know" the person behind the persona. 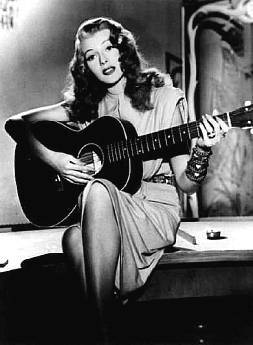 There are many variations of Rita's famous quote about having to live up to this image, but it was something to the effect of, "Every man I've ever known has fallen in love with Gilda and awakened with me." Johnny Farrell (Glenn Ford) and Buenos Aires casino owner, Ballin Mundson (George MacReady) first meet in an alley where Ballin comes to his aid during a hold up. Later, Johnny goes to the casino and after a night of winning hands at 21, he is summoned to Ballin's office. He gets himself out of trouble by offering to go to work for Ballin. After only a few weeks, Johnny works himself up to the position of Ballin's right-hand man, and he is left in charge of the casino when the boss goes out of town. Ballin does not return alone. Soon Johnny is introduced to his beautiful new wife, Gilda (Rita Hayworth). They meet for what Ballin thinks is the first time, and Gilda and Johnny's tempestuous relationship begins, or rather, resumes, as we soon find out. Inside Gilda is a sensitive, vulnerable woman, afraid of her ominous husband, but she keeps this side of her personality well concealed. From the outside Gilda is strong and independent. As time passes, she flirts and dances around with other men -but only if Johnny is in viewing distance. Johnny doesn't notice that she's merely putting on an act to make him jealous. After Ballin reveals to him that he actually is in love with Gilda, Johnny begins to watch over her at all times, to see to it that Ballin doesn't get the idea she's been unfaithful. Still not realizing most of what she does is play-acting, their love/hate relationship intensifies. Soon Johnny discovers that Ballin is more than a casino owner. He is the head of a tungsten monopoly with plans to take over the world. When a man threatens to stand in the way of his grand plans, Ballin kills him. The police know he did it, so he decides to stage his own death. Johnny takes over Ballin's business affairs, including becoming the head of the tungsten monopoly, and to everyone's surprise, he marries Gilda. She marries him for love, but Johnny has an ulterior motive. Almost immediately after the ceremony, he leaves her, saying "She hadn't been faithful to Ballin when he was alive, but she was going to be faithful to him now that he was dead." For nights Gilda awaits Johnny's return. After a frustrating visit to his office, where she tries to tell him that there were never any other men in her life, she begins dating -to get back at him. Gilda soon finds out that Johnny has hired men to watch over every move she makes. After a few of her boyfriends are "taken care of", she realizes she'll never be free in Buenos Aires, so she runs away to Montevideo. She stays away for a while but soon returns with a new boyfriend who unbeknownst to her, is one of Johnny's men. He convinces her that she has to go back to Buenos Aires and get an annulment if she is ever to be free of Johnny. Back in Argentina she discovers that her boyfriend is on Johnny's side, and finds herself trapped again. Meanwhile, the police have learned about the tungsten monopoly and those involved are arrested. The casino is shut down. Johnny avoids imprisonment by cooperating with the police. Detective Obregon (Joseph Calleia), who'd been watching Gilda as part of his investigation, knows she hasn't done any of the things Johnny thinks she's done. He has observed that Gilda is in love with Johnny, and that deep down he loves her. 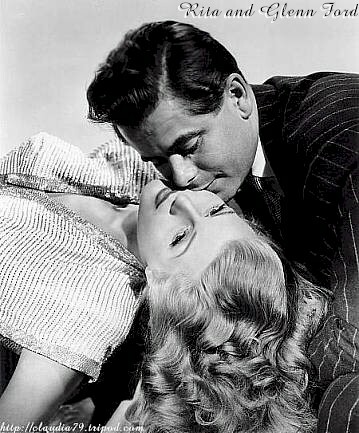 Obregon tells him the truth about Gilda, and Johnny realizes how wrong he's been. As she prepares to return home to the United States, he tells her he's sorry and that he loves her. Just then, Ballin steps back into their lives to reclaim Gilda. Finding them together, he tries to murder them both, but Uncle Pio (Steven Geray), the philosophical bathroom attendant at the casino, gets to Ballin first and saves Gilda and Johnny. Now made up and their love for each other finally expressed, the two depart for North America together. Gilda premiered March 15, 1946 and became one of the biggest box office hits of the year. The Jean Louis gowns Rita wears throughout the film are incredibly beautiful, each seems more exquisite than the last. Rita's spellbinding performance in Gilda continues to captivate more than half a century later. Lyrics to "Put the Blame on Mame"
*Contrary to what some publications have stated, Rita's voice was dubbed by Anita Ellis in this scene as well as the two below. Amado Mio- when we're together, I'm in a dream world, of sweet delight. Amado Mio- Love me forever- and let forever begin tonight"
"Amado Mio- Love me forever- and let forever begin tonight"